ASUS P5B Deluxe/WiFi-AP PCSTATS Review - Great Office and Gaming Systemboard? Great Office and Gaming Systemboard? 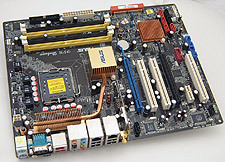 With very little if any real difference between different P965 Express platforms, motherboard manufacturers have had to resort to bumping up feature lists significantly in order to capture your attention. From extra Serial ATA ports to IEEE 1394a and wireless networking, Asus has crammed every possible useful feature into the Asus P5B Deluxe/WiFi-AP motherboard. The 802.11b/g support included in this platform allows the user to connect LAN devices on an 802.11b network at 11Mbps, or on more modern 802.11g hardware at 54Mbps. Best of all, setting up wireless internet access is a breeze with all the commercial routers on the market. Click a few buttons, enter your encryption key and you're set! Of course, once the computer is turned off that wireless access goes away, but still it is a very convenient option with many useful business applications - wireless printing being a prime example. Asus has put together a very well rounded motherboard in the P5B Deluxe/WiFi-AP, and it retails for about $236 CDN ($200 US, £102 GBP). The platform is equipped to handle just about anything you can throw at it. The Asus P5B Deluxe/WiFi-AP is an absolute breeze to work on, it's as if an enthusiast designed the motherboard. The ports and headers are easy to access and should you run into trouble, the Clear CMOS jumper is in a central location. There's plenty of space between the PCI Express x16 slots too. In the benchmarks we saw that workstation type applications fared particularly well, as they do with most Core 2 Duo and Intel chipset combinations. The P5B Deluxe/WiFi-AP performed towards the middle of the pack in the in terms of gaming, so you won't be disappointed there either. 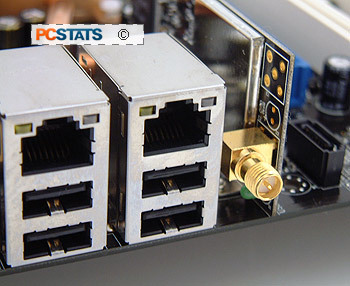 In PCSTATS overclocking tests, the P5B Deluxe/WiFi-AP reached a very respectable 420 MHz FSB. Asus has a reputation for delivering the goods, and in general it does just that. Sure sometimes it could have more enthusiast friendly options, but Asus had done a very good job here, and we find everything we could possibly need in the P5B Deluxe/WiFi-AP motherboard. If you're looking to upgrade to the popular Intel Core 2 Duo platform, this is an excellent motherboard to consider building that new PC with. Pg 11. — Great Office and Gaming Systemboard?